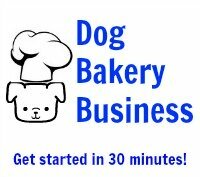 Use mixes for dog bakery cakes and treats and save yourself a lot of time and effort! The mixes are already properly formulated so you don't have to worry about getting the ingredients ratio exactly correct to work properly. The ingredients are healthy and non-toxic so you don't have to spend time trying to figure out if you are using any that should be avoided. This cake mix for dogs is a popular best-seller. 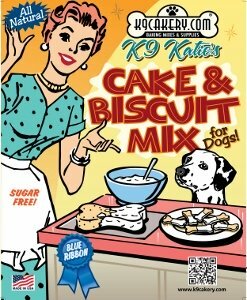 One great benefit for using this mix is that you can make both dog cake and dog treat products from the same package. It is also a dog treat biscuit mix. The instructions are on the back of the box and are very easy and simple to follow. The mix is very complete. You just have to add water and if you are baking a cake, you will add a fresh egg. There is a list of suggestions of other ingredients to add to make different flavors of cakes and treats for dogs as well. 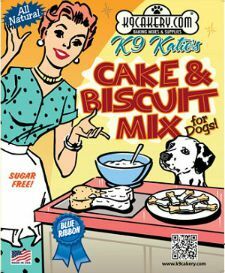 The dog cake mix shown above can be purchased through a wholesale account from K9Cakery.com. K9Cakery.com has been serving pet bakeries for years and is the largest online supplier of bakery supplies for pets. The company has won numerous awards for its innovative products which are specially formulated for a pet's digestive system. Human grade ingredients are used and the mixes are all manufactured and made in the USA. No dog bakery business would be complete without special mixes for dog bakery frosting and icing. Magifrost is a dog treat icing mix that makes dog cake decoration quick and easy. Just add water to the Magifrost dog cake frosting mix, stir and frost. It will dry hard, and the frosting will not melt. If your business is located in a warm, temperate climate, you don't want to take the chance that your customers will return home with melting frosting. Using this specially formulated frosting will ensure that your cake remains as beautiful as it did when it left your kitchen. Magifrost frostings are dairy-free. Many dogs are lactose-intolerant so this is an added benefit. Use this frosting to create stars, shells, borders, and write! Just add water to the dog treat icing mix and stir! Flood an area on your treats. This dog icing will dry hard and very, very shiny and glossy. The icing will maintain that "wet" look. But it will be hard and it will not melt. Feel confident that you can ship your treats anywhere without the icing falling off or melting off. Use this dog treat icing for drizzling and dipping.